When in Agra I visited a marble workshop where men worked day upon day creating marble masterpieces. They inlaid semi precious stones into the marble to make gorgeous tables coasters and hand carved elephants I couldn’t carry one in my hand luggage ( and neither could I afford it) but they were absolutely beautiful. Agra is also the home of the beautiful Wonder of the World known as The Taj Mahal I visited just after the dawn on a magical misty day. I am so very grateful to have had the opportunity. Another busy busy week. Not that I’m complaining as, fortunately, all is good. I took Damnvan1 out of winter storage this week. I am very fortunate in that friends let the camper van live in their barn, so it has been warm and sheltered all winter. This year she did however need a new battery and a minor repair- all down to age I’m afraid. She’s not too old and low mileage but I keep thinking about changing/upgrading her. Shshsh! Don’t tell her! I might keep her forever! This week I’ve also been on a felting course which was free! I like free! It was a two hour introduction course, very relaxed and very informative. We were supposed to make an egg, which I did and then got bored. I went onto make a small piece of felted Textile which is destined to become a Wild Woman! More about that at a later date! Thats all folk see you soon! My Mum filled the box with notions. Now there’s a good word! It was full of pin cushion, scissors, pins, cottons, safety pins and so on. I still remember the delight on Christmas morning 🎄with this gift and I have used it ever since. I was going to paint it but Hubs convinced me not to and I’m so glad that he did.it deserves to remain in its original finish. 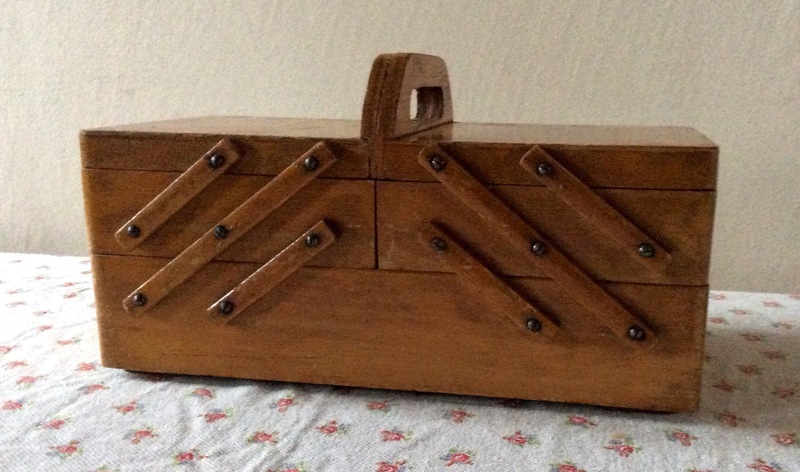 For quite a few years I would take this box to school for sewing lessons. I carried the box alongside a leather satchel full of books, PE kit and cold toast for playtime! This journey was right across town, walking and two bus rides there and back. No wonder I was slim ( well slimmer!) 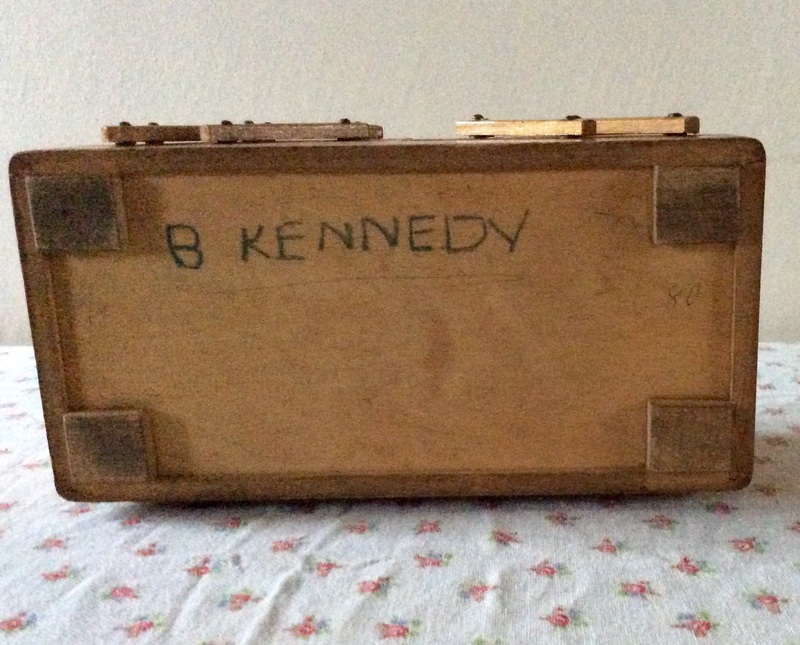 I wrote my name on the base of the box presumably in case I lost it! This still brings a smile to my face. Memories are good.